Shards of Alara, Rare. I use this card as a reason for not ordering mushrooms on my pizza. 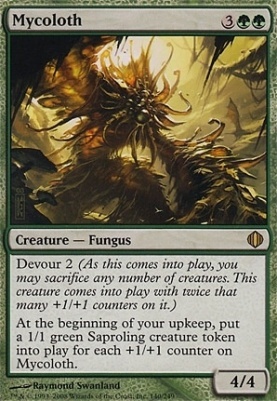 Mycoloth the fungus creature is our featured card today because it is surprisingly versatile for a green beater. I’ll admit that I am a fair-weather friend towards Magic’s color green. For my mana and big creature needs, green is the first place I look. For interesting cards and interactions…. well, I seem to lose green’s number. In general, green seems rather one-dimensional. I play mana, accelerate it by a few turns through the use of Rampant Growth or Explosive Vegetation, use that mana to play big creatures, then use those creatures to smash my enemies until one of us is dead. It’s effective, but just a little too simple for me personally. But every once and a while, there comes a card like Mycoloth. I can make a case for putting Mycoloth in just about any creature-based deck that has green in it. It starts as a 4/4, so it has decent size for a beater, which is only made better if you have it devour other creatures when it first shows up on the field. I mean, if it eats 3 dudes, you suddenly have a 10/10. At each one of your upkeeps, you get a number of 1/1 Saproling tokens equal to the number of +1/+1 counters on your giant fungus of justice (yes, my Mycoloth fights for justice. Yours may have another motivation like pie or something, but mine is for justice). So not only will you have a large creature, but he brings his little buddies to the party every turn. I have a feeling we have all been rushed by an army of tokens at some point, so we can agree it’s best to be on the side of the table that is throwing them around. Aside from swarming, tokens are great just as something to chump block or, my personal favorite, sacrifice. Those Saprolings can be pitched to something like Ashnod’s Altar to give you mana, something like Goblin Bombardment to fling them at the faces of unfortunate creatures and/or players, or Carnage Altar to draw some cards. Mycoloth does a lot for an overgrown pizza-topping.